CLICK HERE, if Alex's comments (2-minutes) are not audible. The audio problem has to do with licensing. Microsoft (MSN) owns the popular MP3 format, which will only play in Internet Explorer (IE, which MSN owns). So Firefox, Google Chrome and Opera may not play the MP3. I was listening to The Alex Jones Show today, Sunday April 26, 2015. I subscribe to their PrisonPlanet.tv each year. It's one of my favorite shows and has been since 2002. I think Infowars.com is the best alternative source of news available. If you're sick and tired of the lying, rhetoric, propaganda and cutthroat hatred from the mainstream newsmedia, then you'll love The Alex Jones Show. SOURCE: The Alex Jones Show, April 26, 2015; a quote by Alex Jones. That is heresy ladies and gentleman. I don't question Alex's sincerity. Alex is one of my secular heroes, but he is not saved. Alex said today on his show that he hopes that his web-visitors will go to Heaven, and then Alex said he also hopes that he'll go to Heaven. I suspected something was wrong already, because born-again Christians “KNOW” that they are saved. 1st John 5:13, “These things have I written unto you that believe on the name of the Son of God; that ye may KNOW that ye have eternal life, and that ye may believe on the name of the Son of God.” The reason why a believer can assuredly KNOW that he or she is saved is because a believer's salvation is not based upon our own goodness; but rather, upon the GOODNESS OF GOD!!! And God sure is good! I know I am saved, 100% positive. I know because God PROMISED to save those sinners who believe. John 3:16, “For God so loved the world, that he gave his only begotten Son, that whosoever believeth in him should not perish, but have everlasting life.” That is a promise from God the Father. Anyone who believes on the name of Jesus, that He died on the cross for your sins and rose up the third day is saved. The fact that Alex hopes he will make it to Heaven evidences that he is trying to be saved instead of trusting to be saved. I became very concerned, when Alex Jones said that the reason he hoped he would go to Heaven, is because he is an upright person. Alex humbly admits that he is not perfect and is not on some pharisaical high-horse. Alex says that he knows good from evil, and he wants to DO GOOD! I also want to do good. I agree with Alex about that, but I'm trying to do good because I AM SAVED, not to BE SAVED. There is a vast difference! A person who is trying to do good to merit Heaven is attempting the impossible, because no amount of good can atone for the sins we've committed in the past. Isaiah 64:6, “But we are all as an unclean thing, and all our righteousnesses are as filthy rags; and we all do fade as a leaf; and our iniquities, like the wind, have taken us away.” As you just read from the Scriptures, even our self-righteousness is as filth to God. We need God's righteousness to enter into Heaven, which is by faith alone in the Lord Jesus Christ. Would to God that every man wanted to do good in his mind, heart and life. I love Alex and he is a good guy, but being “UPRIGHT” is a guaranteed road to Hell, fire and damnation. The Devil's road to Hell is paved with neon lights and good intentions . . . Please listen my friend, living an upright life will send you to Hell for sure. You must be born again as Jesus said. No matter how much good we may accomplish in the flesh during our lifetime, we could never make-up for the sins we've already committed. That means we need a Savior to pay for our sin debt, which is exactly what Christ did for us. Jesus paid a debt He did now owe, because we owed a debt we could not pay. Jesus paid our debt of sin in full. What a beautiful Savior. Now, I'm a big Alex Jones fan, and I've listened to him for several thousand hours over the past decade. And I'd like to say, I'm proud of Alex for cleaning up his website. For awhile some of their staff were putting raunchy pictures and suggestive content on INFOWARS.COM, but I haven't see it for the past year now. So, GOOD JOB INFOWARS! I greatly enjoy listening to David Knight when Alex is traveling, or during Alex's recent stomach surgery on April 1, 2015. I had the same exact umbilical cord hernia surgery in 2007. It went well, better than expected. The surgeon rebuilt my stomach area. It was amazing when I came out of anesthesia to see what had been done. I wish I could say the same about my neck surgeries, which have rendered me much worse. I trust God. The Bible says we live by faith, not by sight. If we get upset everytime things don't work out our way, then we're living by sight. I've learned so much from Alex. Unfortunately and kindly, Alex doesn't understand the Holy Scriptures concerning salvation. Alex views salvation from the natural man's viewpoint, believing that if our good works outweigh our bad, then God will accept us into Heaven. That's not how it works. Alex is teaching Roman Catholic philosophy, that is, you get to Heaven by pursuing good, and by doing good, and eschewing evil and fighting against evil. The truth is that no amount of works, bad or good, has anything to do with Heaven. You don't have to do good works to get to Heaven, and you can't get kicked off the bus going to Heaven if you do bad works either. We're not saved by works, and we're not lost by works. We do good works because WE ARE saved, not to BE saved. Alex needs God's righteousness, not his own self-righteousness. We all need HIS RIGHTEOUSNESS, i.e., God's imputed righteousness through faith in Christ Jesus. Romans 10:3-4, “For they being ignorant of God's righteousness, and going about to establish their own righteousness, have not submitted themselves unto the righteousness of God. For Christ is the end of the law for righteousness to every one that believeth.” The way to be saved then, is to completely rest in the finished work of Jesus Christ. We are saved by the blood of His cross (Colossians 1:20). The Gospel according to 1st Corinthians 15:1-4 is: 1) Jesus died on the cross for our sins; 2) He was buried; 3) He resurrected the third day. Believe, making the Gospel your hope for Heaven, and the work is done. John 6:28-29, “Then said they unto him, What shall we do, that we might work the works of God? Jesus answered and said unto them, This is the work of God, that ye believe on him whom he hath sent.” Jesus paid it all! I've listened to Alex over the years and he has often taught the heresy of Religious Humanism (which is: bettering mankind and improving the world without the need for the new birth by faith in the Gospel of Jesus Christ). No amount of education, reformation, rehabilitation, or legislation can substitute for the need for REGENERATION. John 3:3, “Jesus answered and said unto him, Verily, verily, I say unto thee, Except a man be born again, he cannot see the kingdom of God.” Alex Jones is a good man in my estimation, but he appears to be lost from listening to his testimony. Being upright is not the way to get to Heaven. Being sincere won't help you. We are all dirty sinners, with countless faults. There is nothing possible in this world that anyone can do about their sins. Even if you forsake all your sins (which is impossible), you cannot make-up for past wrongs. Only the blood of Jesus can make everything right. No one ever got to Heaven on their own merit. But everyone who ever went to Hell did so on their own merit. It is God's wondrous mercy and grace that makes salvation possible. God the Father sent His only begotten Son (Jesus) into the world, Who was miraculously born of a virgin, lived a sinless life as the perfect Lamb of God, and then went to the cross to be crucified (the Lamb slain) in our place. Christ died, was buried and miraculously rose up bodily the third day. Amen! This is the Gospel, by which if all men believe, they will be immediately saved. We've heard much hype in the news and tabloids lately about Bruce Jenner, Alice Cooper, Dave Mustaine and Brian Welch all claiming to be Christians now. In each case, their testimonies of how they were saved is vaguely shallow, lacking any emphasis on sin, no mention of the importance of the cross or the miracle of Christ's bodily resurrection, they are silent about the necessity of Christ's blood sacrifice, et cetera. Instead, they merely say that they became Christians and are now Christ followers. I'm am fully convinced that these men are all mere followers of Christ, but have never been born-again by faith alone in the Gospel. Alice Cooper claims to believe the Bible 100%, that it says what it means and means what it says. Sounds good. Unfortunately, Mr. Cooper wouldn't know what the Bible teaches if it hit him upside the head. 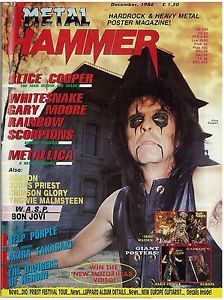 Sickeningly, Alice Cooper, when asked what the Gospel is according to him, says that God put him into the Rock music industry (in the camp of the Philistines as he calls it), and his contribution as a professed Christian in Satan's world of darkness is his testimony (read his shameful words for yourself). See for yourself if Alice Cooper mentions the Gospel, the cross upon which Christ died, His resurrection, or even the merciful grace of God that forgave him of his wretched tens-of-thousands of sins . . .
'The Harvest Show' interviewer asks: We've all heard of the Gospel of Matthew, Mark, Luke and John, what is the gospel according to Alice? If you were to summarize the message that so influenced your life, what would it be? Alice Cooper responds: If it says that Jonah was swallowed by a whale, then it means it. I don't believe this stuff that it's all well, you know, it's kind of, those are all parables. I say if it says it, it means it. You know and, people will laugh at me and say, 'Well, you know, you can't really believe that.' And I go, 'Well if God can believe that God created the world and created everything in it, why wouldn't I believe a simple thing like that? That's not a hard thing. You know, the very fact that He cared enough about me to save my life about 20 times. You know, and ah, help me survive a million different things, to help put me where I am now. And then the challenge I have now being a Christian in the Rock business. You know, He kind of put me in the camp of the Philistines, which is ok.
'The Harvest Show' interviewer asks: What's that like? Alice Cooper responds: Well, you have to live your life every day. You have to live your faith. You know, I'm living in a world that's not my world. I know that, but I live in it, and I try to live my faith every day in it. That's my testimony! What a bunch of bullcrap! Ladies and gentleman, you just read the testimony of a religious unsaved man who is doing much to harm Christianity every day of his life. Alice Cooper travels all around the world glorifying Satan with his music. Rock music has always been the Devil's music. Notice that Alice was asked to summarize the greatest message he had ever heard that influenced his life. The interviewer references the Gospel of Matthew, Mark, Luke and John. The best Alice could come up with is that he takes the Bible at face value (but is woefully ignorant of its truths) and is trying to live his faith in Satan's Rock music industry. There is no mention of Christ at all. It is clear to me that the god of this world, who blinds men's minds from the glorious light of the Gospel, continues to blind these men, otherwise they would receive the Gospel and truly become born-again. False conversions are prevalent in America these days. Romans 3:18-20, “There is no fear of God before their eyes. Now we know that what things soever the law saith, it saith to them who are under the law: that every mouth may be stopped, and all the world may become guilty before God. Therefore by the deeds of the law there shall no flesh be justified in his sight: for by the law is the knowledge of sin.” God's law (aka, Ten Commandments) is a measuring stick, by which when men are compared, they are all shown their guilty condition in God's eyes. I am convinced that Alice Cooper (heavy-metal rocker), Bruce Jenner (cross-dresser), Brian Welch (heavy-metal rocker) and Dave Mustaine (heavy-metal rocker), have never truly repented in a Biblical sense. Ephesians 2:8-9, “For by grace are ye saved through faith; and that not of yourselves: it is the gift of God: Not of works, lest any man should boast.” Eternal life is a free gift (Romans 5:15,18; 6:23), which cannot be earned or merited in any way. A “gift” proper may only be received, free from all past, present or future obligations, and pending nothing. Thank God for the undeserving gift of eternal life by faith alone in Christ Jesus our Lord. No amount of good works, religious dedication, commitment to do good, reform, turning over a new leaf, nor following Christ is the Gospel. You may do all these things and yet never have been saved at all. The issue of sin must be addressed. Alex readily admits that he is a woeful sinner in God's eyes. So am I for that matter! All that remains is for Alex to embrace God righteousness, through faith in Christ Jesus. No one needs to hope to go to Heaven, because God had PROMISED to save those who believe. (1st Corinthians 1:22). We can know, with sweet peace that we are guaranteed a home in Heave. I know that I am going to Heaven, because God made me a promise; and you too can go to Heaven if you'll place your faith in the Gospel (good news) of Christ crucified and risen. We don't get saved because we are good, but because God is good. Oh how America needs preaching and praying preachers! 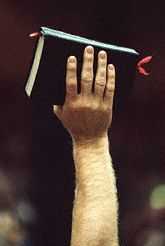 Preaching without prayer is dead, and prayer without preaching is shallow Christianity!! !